Cultural Innovations’ Senior Consultant James White recently went to Kulturforum in Berlin to attend the Connected Audiences Conference. The conference had interesting expert talks on emotions and audiences from speakers such as PGAV Destination and Den Gamle By Museum. Really interesting, and left with plenty of reflections and food for thought! Cultural Innovations were delighted to attend the launch of Battersea Heritage and Learning Hub and see the exhibition space filled with visitors. Completed at the end of 2018, the CI team provided content interpretation and exhibition design for the heritage hub, situated in one of the entrance ways leading up to the power station. The exhibition explores Battersea’s heritage, how the power station worked and the regeneration and future of the area. As part of the Cultural Innovations’ festive celebrations this year, the team took a trip to Windsor Castle. The day started off with an expert talk on restoring the castle after the fire of 1992, which provided a fascinating insight into the challenges and decisions faced by the restoration team as well as the historical context of the castle. A walk around the State Apartments provided the opportunity to see the restored rooms, exquisite interior designs and the chapel; all magnificent to see and packed with interesting stories. The day wrapped up with a Christmas meal at The Duchess of Cambridge - the cherry on top to a fabulous day! The challenges and lessons learnt from lighting one of the largest cultural projects in the world, made for an illuminating presentation at the LUX Live 2018. Mark Sutton, founder of Sutton Vane Associates, gave a talk about the lighting design for the Sheikh Abdullah Al Salem Cultural Centre and how they delivered the project. Cultural Innovations’ 3D designer Tanya also had a chance to look at the new lighting technologies and innovations showcased at the event. Cultural Innovations’ Senior Interpretation Developer, Luanne, was invited to Brandenburg University of Technology (BTU) in Cottbus, Germany last month to give a keynote speech on international heritage careers. Luanne’s talk kicked off BTU’s first annual MA World Heritage Studies conference – a brilliant way for current students and alumni to share careers experience and advice. Participants were intrigued by the idea of working in a heritage business – an area many hadn’t considered before. Alumni also spoke about a fascinating range of international experiences from coordinating a European City of Culture bid to working in Australian museums. Luanne then had the chance to explore the beautiful medieval city of Cottbus and visit Berlin’s wonderful Museum Island. Cultural Innovations' designer Sophie, has recently returned from a trip to China and Japan after visiting a range of heritage sites, places of outstanding natural beauty and museums filled to the brim with fascinating artefacts. The photo on the left shows the unique pillar formations at the Zhangjiajie National Forest Park in China. These formations are created as a result of physical erosion, and have inspired similar formations in the film 'Avatar'. After working on the Sheikh Abdullah Al Salem Cultural Centre for the past five years, we are excited to see it finally open to the public this month! It has been rewarding to see visitors interacting and enjoying the museums on their social media posts, as well as partaking in various workshops and seeing shows. See the museum's website here. Martyn Best recently visited Saudi Arabia to see the progress being made on the Atturaif Visitor Reception Centre. Cultural Innovations worked with the Arriyadh Development Authority in 2011 to develop the galleries and exhibitions as well as reviewing the content. See our full project profile here. Earlier this month, a team from CI went out to Vietnam to the city of Hanoi and to Yen Tu Mountain in Quang Ninh Province. The team presented the concept design in Hanoi for the Da Lat biology museum before travelling up to visit the site at Yen Tu Mountain for the Exhibition of the Enlightened King. Cultural Innovations CEO, Martyn Best, talks to The Times about the company's ongoing involvement in Saudi Arabia's museum world and the importance of personal relationships when doing business with the kingdom. Read the full article here. Cultural Innovations designer Sophie attended the Nesta event 'Good and Bad Help' in early February. Nesta introduced a report that is co-produced with Osca, which looks at how services and social programmes in this country can be improved. It was a great networking event with attendees from many different industries and gave food for thought about CI's involvement in the museum design industry. In the beginning of December, the CI team took a festive trip to Shakespeare's Globe to celebrate Christmas. The weather held off, and we were given a fascinating tour of the magnificent Globe and The Rose theatre, finished off with an Elizabethan dressing demonstration modelled by our very own Roger. CI made a donation to the Trees for Cities charity on behalf of everyone who wore a Christmas jumper on the 15th of December. The National Geographic included this impressive shot of our friends at Blue Rhino Studio putting the finishing touches to a standing Quetzalcoatlus northropi model for a new museum in Kuwait. We're seriously impressed! Tanya and Sophie, two of our designers, attended the Sackler Conference held at the V&A on the 24th November. The conference started with architect Amanda Levete giving an inspiring overview of the new entrance and temporary exhibition spaces she designed for the V&A. The day went on to host a great selection of international, national and resident creatives, curators and directors, with poignant presentations. Cultural Innovations worked with our client (Tatweer) T4edu, part of the Ministry of Education in Saudi Arabia to plan the renovation and renewed fit-out of the science centres in Jeddah, Taif and Abha. We delivered the Program’s Strategic Masterplan in 2012 before being appointed under a three year contract to oversee the design and delivery of a number of science centres and support programmes. The centres opened in 2014 and are proving very popular with students and educators. A member of the public captured a video of the Sheikh Abdullah Al Salem Cultural Centre as construction work continues on the 13 hectare site. The construction of the cultural centre is progressing well with the opening of the galleries slated for the end of 2017. Cultural Innovations has been appointed by the Tung Lam Development Company on the new Museum of the Enlightened King at Yen Tu Mountain, Quang Ninh Province, Socialist Republic of Vietnam. We are responsible for all content development, interpretation and exhibition design on this 465m² new museum. There are eight separate zones in the new museum that tell the story of the 13th century Vietnamese King Tran Nhan Tong and the Vietnamese Buddhism Sect that he established known as the Yen Tu Truc Lam Zen Sect. The museum is slated to open in January 2018. The 10 Year Anniversary of the NAMES network was celebrated with a Conference in Amman, Jordan, hosted by The Children’s Museum Jordan under the Patronage of Her Majesty Queen Rania Al-Abdullah of Jordan. Cultural Innovations was represented by Bill Hart at the three-day conference, which included keynote speeches, panel discussions, interactive shows, workshops and an exhibition fair. Over 230 delegates, representing more than 25 countries, celebrated the importance of science in enriching all of our lives. A special word of thanks to Sawsan Dalaq, the Director of The Children’s Museum, her deputy Shireen Sabanegh and all of their colleagues at the museum, for hosting such an enjoyable and successful conference and associated activities. We are delighted to announce that on 17th October 2016, Cultural Innovations achieved certification for ISO 9001 :2015 for International Museum and Cultural Heritage Consultancy. Everyone at Cultural Innovations is incredibly proud of this achievement and we are extremely grateful to The British Assessment Bureau – the Certification Body that has expertly guided us through the whole process of certification. ISO 9001 is a quality management standard that helps organisations of all sizes demonstrate they deliver a consistent high level of service and at the same time the standards are a recognised way of demonstrating our credentials internationally. Having the standard in place has already helped us become a better company and we thoroughly recommend the whole process of seeking certification. Tanya and Sarah, two of our exhibition designers, attended the Touring Exhibition Group (TEG) Marketplace 2016, held in Bradford on the 12th and 13th of May. This year’s seminar themes focused on working in partnership, with speakers from the British Museum, Heritage Lottery Fund and Arts Council England. TEG had organised some excellent visits, including the collection and open storage of the National Media Museum and they also visited the Impressions gallery. The second day was spent at Cartwright Hall Gallery reviewing some of the latest touring exhibitions. Another great event from the TEG, with superb networking opportunities and a really enjoyable social side to the two days. We are delighted to announce that Lizzy Moriarty has joined the Board of Cultural Innovations as a Non-Executive Director. Martyn and Gill are currently in Washington DC to attend the American Alliance of Museums (AAM) 2016 Annual Meeting & Museum Expo. The event runs from 26th to 29th May and this year’s theme focuses on the power, influence and responsibility of museums worldwide. With over 3,000 attendees, the Annual Meeting & Museum Expo is the world’s largest gathering of museum professionals and Cultural Innovations is proud to be one of the AAM’s industry members. We would like to congratulate our client, TAAWON – Welfare Association, on the formal opening of the Palestinian Museum in Birzeit on 18th May 2016. It was a privilege to work with the TAAWON team on the strategic development of the museum and we are delighted that the strong concept for the Palestinian Museum has been delivered in such impressive form. Washington Post article here. Arabian Gulf: Lands of Opportunity? On 7 March the RIBA organised a Seminar on Working Internationally with a focus on the Arabian Gulf. Martyn was invited to speak on ‘Working in Saudi Arabia’. Taking the theme of a Personal ‘Journey’, Martyn presented an outline of working in Saudi Arabia through examples summarising over 25 years of working successfully with the Kingdom of Saudi Arabia. A few members of the Cultural Innovations Design Team went out to Kuwait at the end of February to see the progress on site for our Sheikh Abdullah Al-Salem Cultural Centre. On site construction is coming along well and the girls were even able to stand inside what will become their aquarium. Tanya and Sarah, two of our designers, visited the Milan Expo 2015. Apart from having a fantastic time visiting a wide variety of pavilions, they experienced the Expo at its peak. With visitor numbers almost at capacity it allowed them to explore some areas which are normally bypassed by the majority of visitors. The most exciting of these areas being the childrenpark, a play area for children which was a fantastic space designed for families to escape the crowds and allow children to explore the Expo in their own way. Interactive elements which engaged both parents and children created a family feel to the space, with colourful structures inviting visitors in to explore. December 17th was Christmas Jumper day at Cultural Innovations. Everyone participated and an award was made for the best jumper – in the face of stiff competition it was won by the penguin. Cultural Innovations made a donation to the NSPCC for each jumper that was worn during the day. Cultural Innovations are delighted to be working once again on the Royal Botanic Garden, Jordan - the first botanic garden in Jordan. This unique 400 acre garden in the mountains above the capital city of Amman will aspire to provide a 21st century, world-class attraction for the people of Jordan and its visitors by demonstrating inspiration, excellence and leadership. The Mission of the Royal Botanic Garden of Jordan is to ensure native flora conservation through ecological restoration and provide a research and demonstration site to address the environmental challenges of our times and generate hope for the future. Cultural Innovations was delighted to play its part in the GREAT Week held in Milan during September 2015, building on the critically-acclaimed UK Pavilion at the Milan Expo. Brilliantly organised and managed by Sue Bishop and her team at UKTI, Bill and Sherif attended the full week as UK industry delegates. The first day's programme concentrated on the Youth of Today, Future of Tomorrow and on the second day we focussed on Attractions, Museum and Major Cultural Projects. On the final day we were treated to a visit to the Expo site itself and a VIP tour of the British Pavilion. Cultural Innovations urges everyone in our sector to get behind Sue's team, who are pulling out all the stops in supporting the UK's creative industries across the globe. We are delighted to learn that the National Gallery Singapore is scheduled for a formal opening on Friday 27th November. Our involvement in the project started immediately after Studio Milou won the Architectural Competition. We were able to work with the National Gallery Team and Studio Milou to develop significant elements of the Operational and Functional Planning to inform the development. We were given a tour of the project in March this year and are honoured to have been invited to the opening. Our Sheikh Abdullah Al-Salam Cultural Centre project is moving forward, with the start of Detail Design and Fit-Out due to begin imminently. We would like to hear from Exhibition Designers, Content Developers and Audience Researchers who may be interested in joining the CI team for this exciting project. On 23 September we visited the site in Kuwait of our Sheikh Abdullah Al-Salam Cultural Centre. The main construction work is progressing rapidly on all museums and the scale of the spaces is very impressive. The wing spaces in particular are spectacular. The installation of the first sections of glazing now gives a good impression of what the finished spaces will be like. We are looking forward to seeing the exhibitions realised in these spaces. On 6th July 2015, Bill and Sherif took part in a discussion hosted by the Centre for London on the merits of London hosting the 2025 Expo, the world’s largest cultural event. Ten years after winning the right to host the 2012 Olympics, London government is now considering bidding for Expo 2025. The discussion took place at Level39 Canary Wharf. Following what can only be described as a robust exchange of views, the audience gave a resounding “green light” to London bidding for Expo 2025 – a view heartily endorsed by everyone at Cultural Innovations. Over 4,500 people attended the 2015 American Alliance of Museums Annual Meeting in Atlanta GA. The overall themes of the Congress were The Social Value of Museums. Cultural Innovations, The Museum of Islamic Art from Doha and Morris Hargreaves McIntyre jointly presented a session at the Congress on the topic of 'The Increasing Social Value of Museums in the Middle East'. To listen to the session with simultaneous co-ordinated presentation images follow the link below. We will be convening a session on Wednesday 29th April at this year’s American Alliance of Museums meeting in Atlanta, US. Our conference session, called The Increasing Social Value of Museums in the Middle East is jointly run with the Museum of Islamic Art, Doha and Morris Hargreaves McIntyre, UK. We hope to generate some lively discussion about the unique roles and potential of museums around the Middle East. Join us if you are in Atlanta. In April, Cultural Innovations was pleased to host Dr. Ahmed Sanousi at our London offices to present the final Concept Briefs and Designs for the new Prince Sultan Cultural Centre in Jeddah. The Centre, which aims to promote Health and Wellbeing, includes a walk-through theatre experience about the history of Jeddah and its communities, interactive Health exhibition, suite of multi-purpose art studios and the Prince Sultan Gallery about the Prince’s role and his enduring legacy for the Kingdom and abroad. Our April site visit to Kuwait City revealed yet again how the build of the 4 new museums and Art Gallery for this landmark project are progressing at a rapid pace. CI is currently assisting the Client Teams with Enabling Works before Detailed Development begins later this year. Drone footage (left) shows the impressive scale of construction for the Sheikh Abdullah Al Salem Cultural Centre, Kuwait City. 1400 building staff, working around the clock, are on schedule to complete the complex in July this year. The 32 acre site will feature 22,000m2 of exhibitions over four museums which have been designed by Cultural Innovations. A CI team was on-site last week working with Site Contractor, Al Ghanim. We are currently working on enabling works for the build, following Scheme Design. Martyn Best will be participating in the inaugural GREAT British Week being held in Singapore from 7-14 March 2015. The GREAT British Week is part of the GREAT Britain campaign, which showcases the best of British innovation, creativity and education, encouraging the world to visit, study and do business in the UK. On Tuesday, 10 March, Martyn will be one of the guest panellists, together with Thomas Heatherwick and Martyn Ware, delivering the panel discussion “Better Together or Alone: the Creative Power of Collaboration”. Edge of Arabia art gallery kindly provided the venue for the Cultural Innovations’ Party in February. The evening was a great success and a perfect opportunity to catch up with old friends and colleagues and to forge new friendships. Thank you to all those who came and apologies to those who couldn’t make it. We look forward to working with you all on forthcoming projects. We attended the British Council’s ‘UK-Gulf Partnership’ working meeting for Creative Industries hosted by the British Museum on 25 February. Taking the opportunity, we visited the Ancient Lives exhibition at the British Museum which was revelatory. Using interactive CT scanning technology, the exhibition allows visitors to peel away layers of mummies and manipulate 3D images to reveal remarkable levels of hidden detail. The effect is a very personal, immediate visitor experience that makes us feel closer to the ancient people of Egypt than we ever have. Through our work over many years on the Grand Egyptian Museum in Giza, we have been privileged to view many ancient mummy specimens up close, but the British Museum exhibition is an entirely memorable experience. To be recommended! Cultural Innovations is delighted to announce that we have now joined the Touring Exhibitions Group (TEG) as a Corporate Member. The TEG is the professional group in the UK concerned with all aspects of organising and touring exhibitions. Andrew Wood-Walker, Head of Exhibition Design at CI, commented that with an increasing number of museums - both in the UK and overseas - now considering touring as an option, TEG membership would be a great help to CI in supporting clients in the development and touring of international exhibitions. In December 2014 Dr Ahmed Moustafa launched the publication of The Cosmic Script. It is the magnificent result of 9 years of research and development. Co-Authored with Dr Stefan Sperl from SOAS, the two volume book explores Sacred Geometry and the Science of Arabic Penmanship. It is a remarkable academic, scientific and, most of all, passionate tribute to a life dedicated to exploring Arabic Script and the art of Penmanship. Cultural Innovations is honoured to have been working with Dr Ahmed over the past 7 years. Martyn was in Madinah on 16 and 17 December. Cultural Innovations have been working with the Madinah Development Authority to develop the Terms of Reference for the Madinah Welcome Centre. This is based on the concept developed by Cultural Innovations in 2013 and early 2014. The visit was at the invitation of the Governor, HRH Prince Faisal bin Salman, to present the Madinah Welcome Centre concept. The Welcome Centre is a flagship project for Madinah and will be the first point of contact for large numbers of visitors to the holy city. On 28 November, Sarah and Bill attended the Franco-British Business Forum at the Pullman St Pancras Hotel in London, organised by the French Chamber of Commerce in Great Britain. After an informative welcome address and introduction to the event by HE Ms Sylvie Bermann, French Ambassador, Sarah and Bill participated in the Creative Industries Roundtable discussions and a number of meetings with creative companies and organisations from both France and the UK. The event was a great success and provided an excellent opportunity for companies on both sides of the Channel to make invaluable business connections. It was the first event of its kind in the UK and we hope that the French Chamber continues with the forum in the years to come. The UK represents France's main trade surplus and the UK is the first destination in Europe for French investments. On 3 December Martyn and Sherif attended the one day conference organised and hosted by PWC to address Investing and Operating in the Middle East. (#pwcime) This was a well organised day with a very full agenda. A keynote presentation by Dr Nasser Saidi set the scene covering the Middle East after the Arab Firestorm (Spring) (www.nassersaidi.com). Further presentations by PWC and invited guests expanded on ‘Understanding the Government Agenda’, ‘The Role of Family-owned Businesses’ and the support that UKTI and UKEF can provide. The speakers provided examples from their experiences in the region. Workshops on Megatrends included ‘Shifts in Global Economic Power’, ‘Demographic and Social Change’ and ‘Rapid Urbanisation’ provided the opportunity to share experiences and questions in discussion led forums led by PWC’s regional experts. The event was supported by the ‘Lumi show’ app which provided all necessary information, contact with speakers, active questioning and access to all presented materials. Overall it was a very positive and informative event. Thank you to PWC. Cultural Innovations and Beck Interiors are delighted to be appointed, on behalf of the Astana Expo 2017 Authorities, to design two major pavilions for Astana Expo 2017, themed, ‘Future Energy’, in Kazakhstan. Our design concepts for the Africa and Caribbean pavilions take visitors through dramatic theatrical environments that showcase pioneering initiatives in sustainability and future energy while celebrating the regions’ diverse, vibrant cultures and extraordinary natural environments. Each pavilion will host exhibitions for up to 20 countries. We are looking forward to working with the Astana Expo Authorities to develop the concepts further. Astana Future Energy Expo 2017 will host more than 135,000 m2 of international pavilions, four themed pavilions, a major entertainment complex and conference centre alongside hotel and residential areas. Throughout its 93 day run, the Expo will host a spectacular festival programme that highlights the diversity of the participating nations. Following Cultural Innovations’ Strategic Planning work for the Prince Sultan Cultural Centre in Jeddah, we are pleased to have been appointed to develop the Public Engagement Strategy and Interpretive Design for the cultural offer. The Cultural Centre will be the focal point of Prince Sultan Cultural City, promoting a culture of “wellness” and connecting people with Jeddah’s cultural and artistic heritage. 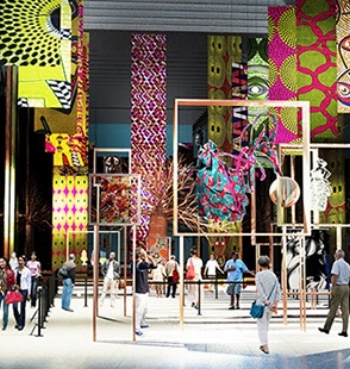 It will include exhibitions, arts studios and an interactive learning centre. Cultural Innovations has previously developed the Cultural Masterplanning Brief, Functional Brief and Business Model for the Cultural Centre. Cultural Innovations was invited to present to the 18th session of the Kazakh-British Trade and Industry Council (KBTIC) at the Foreign & Commonwealth Office in London on 16th October. Bill Hart gave a presentation discussing opportunities for companies in the UK’s creative and cultural sectors to collaborate on Astana Expo 2017 in Kazakhstan. Erzhan Meiramov, Managing Director, Expo-2017 Company, gave a detailed overview of the planning work for EXPO 2017 “Future Energy”. KBTIC meets annually to discuss trade and economic co-operation between the two countries. It includes representatives from UK and Kazakhstan Government and businesses and has become an effective platform to promote and develop bilateral commercial ties. On 11 November, Martyn Best attended the second biannual meeting of the SBJBC in Riyadh. The SBJBC was welcomed by Dr. Abdulrahman Al Zamil, Chairman of Council, Saudi Chambers of Commerce, who hosted the event. Baroness Symons and Sheikh Nasser Al Mutawa chaired the meeting. Cultural Innovations is pleased to be a Founder Member of the newly re-constituted SBJBC. The council aids the development of positive business relationships between UK and Saudi enterprises and provides advice and support to government to further business relationships.